Gadget died shortly after noon on November 19, 2009. I am working on a post about his last night, which was actually quite beautiful, strange, and special. It was sad, but not depressing. Aspects of it were actually joyous, funny, and a little bizarre! I hope to post it by the 18th. Today’s post is a reprint of the first After Gadget post, because it captures so much of what I was going through when I was mourning him afresh. On the anniversary of his death, Betsy and I will plant daffodils on Gadget’s grave. The bulbs were given to us by a neighbor as a bereavement gift last year. We will also partake in other rituals, including reading the notes and cards we received last year. To add to those words, I request that those who knew Gadget, or were touched by him in some way in his life, via internet or youtube or in real life, please post your thoughts and memories about him in the comments section here during the coming week. Or how any particular blog postings about Gadget have affected you. This community means a lot to me. Your words would mean a lot on our day of remembrance. 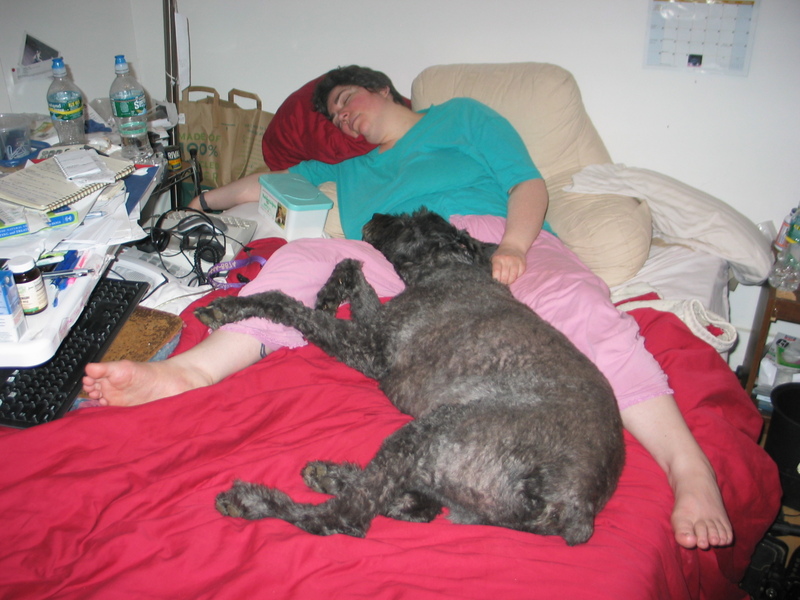 On November 19, 2009, Gadget, my Bouvier des Flandres service dog, died of cancer. That was five weeks and three days ago. He was nine-and-a-half. We waged war against the cancer for six months. Depending on who you quote, from one-in-four to one-in-eight dogs in the US will die of cancer this year. So, we are in good (or rather, bad) company. Why start this blog now? Why not the day after Gadget died? From a practical standpoint, that probably would have made more sense, but nothing about death is practical or neat. Until now, I’ve been too much in shock to do much of anything. I still am in shock most of the time. In fact, right now, writing this blog is the only thing that does make sense. First of all, it’s a way for me to grieve and make sense of this loss. I’m a writer, and so far I haven’t found a way to “cope” that feels like it works. Writing about Gadget, sharing his life and story with the world, seems like the natural path. I’ll share my feelings and my memories of Gadget as a joyful, loving spirit; as a working partner; as a teammate in training and creative problem solving; as a playmate and clown; as my means of survival. In words, in photos, in video. Fortunately for you, he was beautiful. I also hope that for you, if you’ve gone through a similar loss, this will help you grieve, too. Grief in all its forms is welcome here: numbness, anger, denial, sadness, loss, relief, questioning, or whatever you feel. There are very few resources that I’ve found for grieving the death of an assistance dog. There are groups who understand the loss of a beloved pet dog. I belong to one such listserv, and it has been a lifeline. The people on it are loyal and open and funny and kind. I love them. When people help me, even when they are doing it because they love me or they’re being paid to help me, or both, they are never thrilled to do it. Sometimes they are resentful, frustrated, irritated. Sometimes they’re not bothered at all, but I worry that they are, anyway. When I cry over the loss of Gadget, it’s not just his soft fur, his wet nose, his deep brown eyes, his beating heart against mine, it’s also how much physically harder and more limited my life has become. How much more dependent and scary. His death has created so many layers of aloneness in my life. Some of these layers of aloneness are common for pet bereavement, but some are unique to assistance animal loss. Sometimes it is even hard to get support from others who have lost service dogs. There are groups for assistance-dog partners who are grieving, but they may be small or inactive. My guess is that unless one is in the midst of grieving, it is too painful to be exposed to the topic. That emotional wound could reopen at any time, because — if we’re fortunate — we will outlive our assistance dogs, again and again. 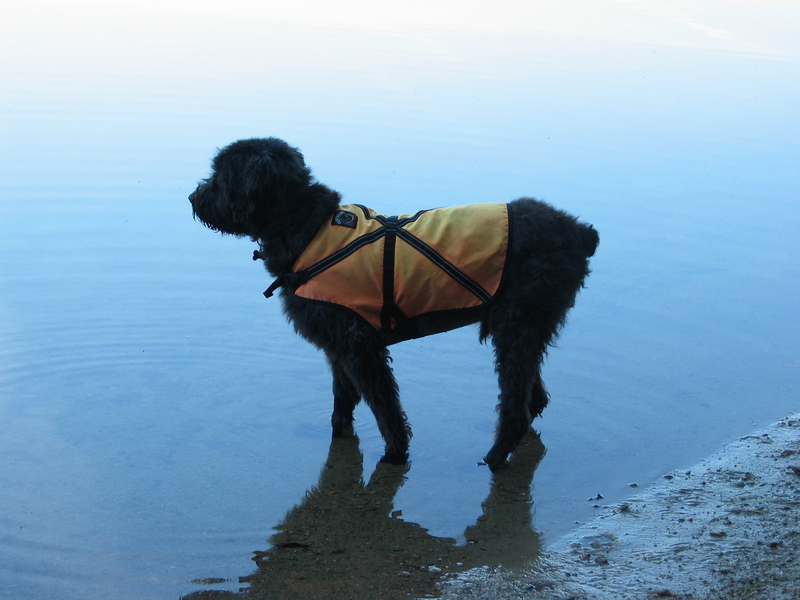 The choice to be a life-long service-dog partner is as Kafkaesque as it is fulfilling. Few who have escaped the black hole of that loss want to be reminded of staring into the abyss again. This will be a refuge to cry, to remember, to distract yourself, to laugh, and to find little ways — or big ways — to move on. All forms of sincere emotion are welcome here. There is no wrong or right way to grieve. There is just emotion that moves through you, that rises and falls like waves, and the process of surviving loss. The loss of an AD is not just that of the heart, but of love, companionship, independence, safety, and partnership. I will be getting a puppy in several weeks whom I will train to be my next service dog. The puppy is due to be born in a week, January 1, 2010. Looking back necessitates looking forward, and vice-versa. Even as I mourn Gadget, I prepare for his successor. Training the new dog in a Gadgetless home will be part of my mourning process. Here, you can join me on my journey as a severely and multiply disabled first-time puppy raiser! It seems a ludicrous, risky undertaking. Even healthy people find puppies exhausting! Yet, I’d always planned for a puppy this time around, instead of adopting an adult or adolescent, as I’ve done in the past. I thought Gadget would be here to help train the pup, as his predecessor helped train him. Now it is just us humans to raise the pup, and me much more disabled than when I trained my previous SDs. Still, I am full of hope. I am excited and nervous. I already anticipate the joy and frustration, the weariness and triumphs, and how it will take everything Gadget taught me to be very, very, very patient to get through two years of raising and training to get a working service dog again. A dog whom I am sure I will love and come to rely on, but who will never be Gadget. I wish you’d gotten to know him as I did. But here at After Gadget, you will know him a little. Thank you for joining us in this journey. P.S. I welcome your thoughts and feelings on my journey or on your own journey — whether you are facing a current loss or have lived through it in the past. Leave comments below. Cura is my first Assistance Dog. I must say that I am not looking forward to the end of her career. I, too, anticipate her being able to help train her successor — but I try not to think about it too much. I have lost pets before — but this is different! I haven’t even experienced it yet, but I know it in my bones that it will be harder. Sharon, Im so sorry this damn anniversary is coming up. I posted something on one of the boards recently that we belong to & I said that Id give ANYthing to turn back the clock & NOT have Kibo dx with Lymphoma … BUT … one small silver lining in the whole experience was the friends Ive made on line, & the dogs Ive met, including you & Gadget … & of course Mr. Barnum as well. & the dogs Ive come to love. & I did love your Gadget! Who wouldnt??? There are a few dogs still on the board, who I feel a special kinship with, & of course their owners, b/c we fought the fight together, at the same time. Im sure, like me, every time you opened one of the boards, there was a major apprehension & fear, b/c you knew the likliehood one of these other dogs would be deteriorating, or already have gone to the bridge. You lost your Gadget way too fast. No matter how long we have, its not long enough. But I remember being so saddened by Gadgets 2nd dx, that time of MAST cell, & I especially felt WITH you, not b/c my Kibo got a 2nd dx, but b/c my other dog Sana, got a cancer dx while Kibo was battling the Lymphoma beast. So, I felt intensely for you. My memories of Gadget – from your postings – vascilate between rembering a goofy big old boy …. & a stoic sweet guy. Your writing brings him (still!) to life for those of us who couldnt meet him in real life. He was an amazing creature. Just incredible. My thoughts are with you. My love is with you. Gadget, and your work helping him through Lymphoma, helped many who only got to know him on the web. Your great research and sharing of his story was an inspiration to those of us who were also going through the same process, that of doing everything we could for our heart dog. Gadget is waiting there, with all of our beloved dogs, for the day we all reunite at the our beloved pets at the rainbow bridge. Until then, he still lives on, in a different form, in your heart. Thank you so much. This made me choke up. You really nailed it on how it feels to be part of this community — the love and the dread and sorrow. I felt very close to you and Kibo, because of the funny stories about happy, loving Kibo who wagged his tail even when he was so weak, and being Magic Bullet dogs and also because Kibo was such a fighter for so long, and also especially to you since you got dealt the double dose of MCT and lymphoma, like me. I really treasure this comment. Hello Sharon! As this milestone nears, I hope the impressions Gadget made, and the memories he shared, will ease the pain of facing 1 year of loss. When you joined the LHD list, you put so much effort into all the research you did for your boy, and you were so generous to share that all. So many people are hit with a dx of lymphoma, and it cripples them. YOU, however, went to war on the disease and battled with everything you had to fight for Gadget’s life. Your dedication to helping him, was inspirational to many of us that read your posts. I have no doubt that Gadget knew how lucky he was to have YOU as his advocate. He must have been one VERY special boy, and you must have shared an unfathomable bond, to have shared such devotion in life, cancer, and death. Thank you, Bettina. This was beautiful. I appreciate it so much. You have done so much for not just your Niko but for all the people and dogs who lost the struggle to cancer, by working on the LHD angels list. I’ve been touched and impressed by all you and Sue have done to create a home for us to grieve and support each other who battled lymphoma and lost. 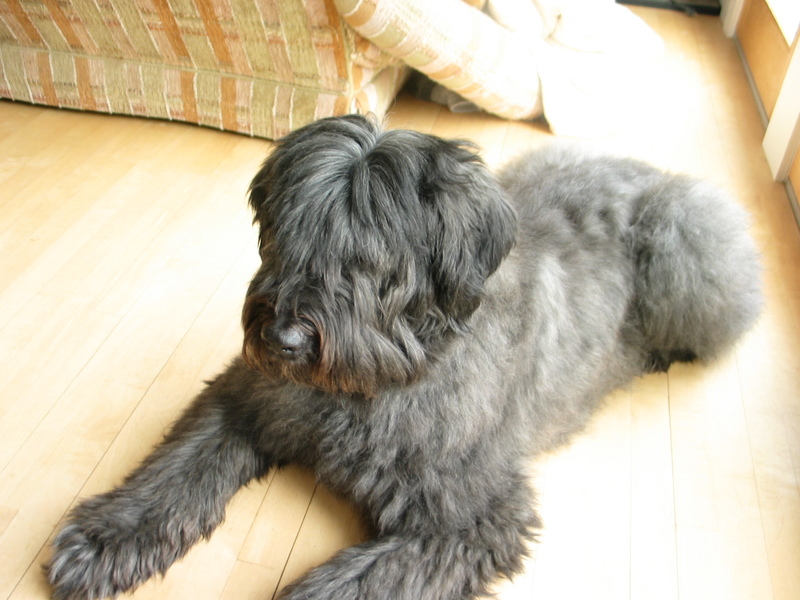 I am touched to tears, partly because I know that when I lose my dear Foof (as I have nicknamed him for his soft, foofy hair – the name I call him even more than his given name), I will be a wreck. Even when I need to retire him, which I expect to be years before he passes on, I know I’ll be a mess. A year and a half in, I can’t imagine being without him and the only occasion I’ve spent more than a few minutes away – that dreadful night they barred him from the ER – felt like the loneliest time in my life. I know academically that I’ve been more alone than that, but he is my second self, and to be separated from him makes me feel less than whole. I do not know if we would have met, had Gadget lived out into a long old age, but I am glad to know you. We’ll be here for each other, as we outlive future service dogs, eh? I’ve sometimes thought of switching to a service mini horse after Hudson, because their working lifespan is about 30 years, but…well, horses just don’t feel about their people the way dogs do. I grew up riding horses, and it seems to me that they do care, but they don’t think of people as their family. Even if they did, herd-structure is looser than pack-structure, generally speaking. but he is my second self, and to be separated from him makes me feel less than whole. Yes, this was exactly how it felt with Gadget. I think this epitomizes the assistance dog bond. When Gadget died, not only did I feel truly heartbroken — a term I had thought metaphorical before — but I also felt as if I’d lost a piece of my body. We were a unit, two parts of a whole. The one night he had surgery (in the current post) was the only time we ever were separated over night, and then, a few months later, he was just gone, every night, forever. And I felt like nothing would ever make sense again, that I’d never be whole again. I still don’t feel whole without him, although that sense of emotional phantom limb pain that I had in the months immediately after his death, where I kept looking to him to do something — open the door, deliver a message, pick something up — and he wasn’t there, and it was like my arm was missing, that feeling is not with me all the time anymore. Thank God. I am very glad you and I have met, and I gratefully accept your offer that we should both be fortunate enough to outlive many more service dogs and support each other through that. I’m so grateful for all the wonderful people I met because Gadget got cancer. But I have a feeling that you’re like me in that I don’t see things as “everything happens for a reason.” Well, yes, technically everything does, in terms of cause and effect, but I don’t think that because something happens, there was a GOOD reason for it. Sometimes horrible things just happen, and maybe something good comes out if it, but it would still be better if the horrible thing hadn’t happened. That’s how I feel about Gadget’s death. I would give anything for him still to be here and happy and healthy and working and whole. AND I am also glad to have met you and the LHD angels people and all the other assistance dog bloggers and people as a result of After Gadget. I wish there could have been an After Gadget without it being after Gadget. Love to you, Sharon, and to Gadget and Barnum. I hope that Gadget has met my baby Randi at the Rainbow Bridge. She wasn’t a service dog but my beloved pet, a purebred Siberian Husky with one brown and one blue eye. I like to imagine my childhood parakeets, Susan and Fancy, riding on her back, or flying alongside her as she runs and plays. My heart breaks for you Sharon and for everyone who has lost a pet, beloved friend, confidante, service animal. You’re in my heart and my thoughts. Thank you very much, Kat. I appreciate your thoughts and kindness and reaching out.